Watch tips measures approximately 1-1/8" long and 1" at widest point. 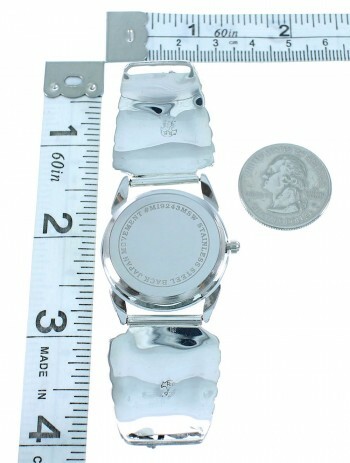 The watch will fit a wrist that is approximately 7-7/8", if you would like the band can be adjusted to fit a wrist that is from size 5" to size 9" at no additional cost to you, this will guarantee that the watch will fit your wrist comfortably (YOU MUST NOTIFY US OF DESIRED CHANGE TO WRIST SIZE OR YOU WILL RECEIVE THE WATCH AT THE SIZE MENTIONED ABOVE!). We are one of the few if not the only business on the Internet that offers to size the watch at no additional cost to you. The watch weighs 52 grams. 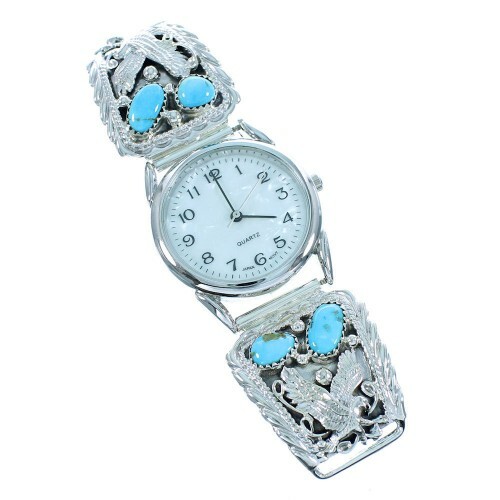 This is truly an outstanding watch that will make a great impression! 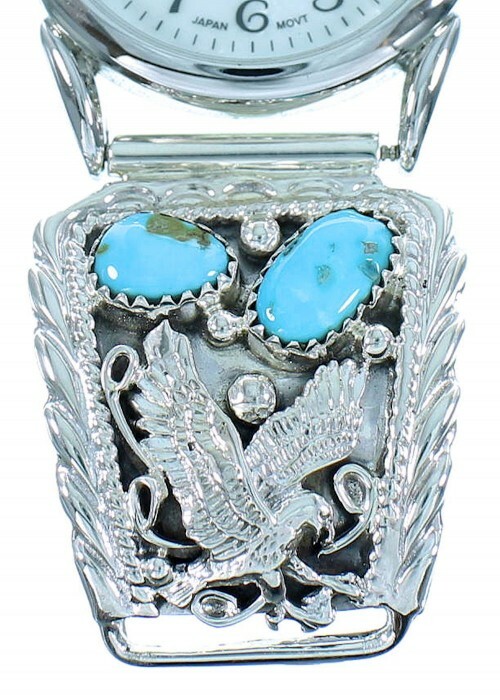 This piece of Native American Jewelry is Navajo hand crafted, by artist J. Saunders, out of genuine sterling silver and real turquoise stones. There are a total of FOUR stones that are carefully placed in hand cut bezel settings, while hand crafted silverwork creates beautiful eagle designs. Twisted silver and mini silver beads accent the watch for a wonderful finish. In Native American beliefs, the eagle is the master of the sky; he is considered to be a carrier of prayers. Many of the Indian Nations admire the eagle for bravery and special connections to the creator. The watch is stamped .925 (sterling) and hallmarked.